Mexico’s indigenous groups have long been a rich resource for investigations of all manner of research concerning culture, linguistics and sociology. In this post, we consider Spatial Reasoning Skills in Tenejapan Mayans, a study relating to geographic reasoning, which relied on the participation of indigenous Tseltal-speaking Maya in Tenejapa (Chiapas), southern Mexico. According to the inter-census population count in 2005, Tseltal (aka Tzeltal) is spoken by 371,730 individuals over the age of 5, making it Mexico’s fifth most-spoken indigenous language (after Náhautl, Maya or Yucatec Maya, Mixtec and Zapotec). 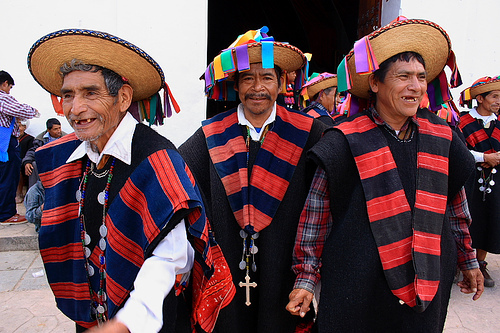 More than 25% of Tseltal speakers are monolingual and do not speak Spanish. They reside in several municipalities of Chiapas, including Ocosingo, Altamirano, Tenejapa, Chanal, Sitalá, Amatenango del Valle, San Cristóbal de las Casas and Oxchuc. They then compared how a group of Tseltal speakers tackled simple orientation tasks that required egocentric spatial reasoning skills. Their expectation was that Tseltal speakers would be poor at these tasks compared to a control group of Tseltal speakers who also spoke Spanish (which has many egocentric words). Tzeltal elders – looking right or left? Credit: Enrique Escalona, México D.F. The expectation was that Tenejapans would find egocentric reasoning much harder than geocentric spatial reasoning since their language has no egocentric vocabulary for anything beyond their own bodies. [Tseltal “does have two “body part words “xin” (left) and “wa’el” (right)”, though they are never used for anything outside the body.] This expectation was based in part on an earlier anecdotal report that “a Tenejapan blindfolded and spun around 20 times in a darkened house was able to point in the agreed [compass] direction while still dizzy and blindfolded”. To some people’s surprise, the Tseltal speakers were able to solve tasks requiring egocentric skills at a rate far higher than mere chance would suggest, and indeed with a higher success rate than tasks requiring geocentric skills. The researcher concluded that tasks requiring egocentric spatial orientation skills are actually easier than those requiring geocentric spatial orientation, and that the absence of “left/right” in a language does not necessarily translate into any conceptual gap. If Tseltal speakers don’t use “left and right” to locate objects, how do they describe where things are? Li, P., Abarbanell, L.,& Papafragou, A. (2005). Spatial reasoning skills in Tenejapan Mayans. Proceedings from the 27th Annual Meeting of the Cognitive Science Society. Hillsdale, NJ: Erlbaum.